1. As I've done for the past two seasons, I will recap each and every Steeler game this year. You can usually look for these sometime on Monday morning. You know, because no one analyzes Steeler games the day after. 2. Look for more interviews with sports and sports media personalities. I've already lined up a few big names for the next few months that I think you'll enjoy. 3. I'm hoping to do more "in-person" articles, or at least as many as my schedule allows...things along the lines of the "Mondesi's House Field Trip" style. 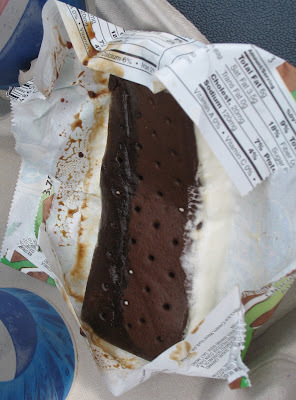 Hopefully I won't encounter any more melted ice cream sandwiches along the way. 4. Once a week, I'm going to author some sort of Top 10 list, given their popularity around the web and the fact that I like writing top 10 lists. 5. Polls have always proven popular on the site, so once a week I'm going to post a series of hot-button issues which you can vote on via interactive polls. 6. I've live-blogged a grand total of one time in my life, and I'd consider it a successful experiment. I'm really hoping to make this a regular feature one day a week, at least during football season. Like Limas Sweed, this falls under the "project" category. 7. I've arranged for some really great prizes and sponsors to be used in a number of upcoming contests. These will become a greater part of the site in the future as I line up some free stuff to reward your loyal readership. 8. News and Notes will continue to be seen 3-5 times a week to round-up the best of the web. So there you have it. In short, I want to continue my summer goals of more original content and less regurgitation of news. The main goal, as usual, is to make reading Mondesi's House a more enjoyable experience. I think it would be better if, instead of posting the Mondesi's house blog on the internet, if you could have Sidney Crosby hand deliver it to us at our homes each day. Thanks in advance for your cooperation.